3. The Good Life. 3.1. Definitions. ⊕ Socrates, 470-399 BCE. Plato, 427-347 BCE. Socrates was ugly by Greek standards. Alcibiades likens him to the Sileni and particularly to the Satyr Marsyas (Symposium 215a). Critobulus (son of Crito), in Xenophon's Symposium, says that if he were not handsomer than Socrates, he would "be the ugliest of all the Satyrs ever on the stage" (Xenophon, Symposium 4.19). (Crito was contemporary with Socrates and one of his companions. Critobulus was one of Socrates' young followers.) The statues of Socrates made in later times do not capture the strangeness of his appearance. Socrates is the best known figure in philosophy, but little is known about him. What he thought has to be reconstructed from what others said about him, since he wrote nothing. Plato is most important source for understanding what Socrates thought. He was in the circle around Socrates, and he left dialogues in which there is a character named Socrates. Plato's dialogues traditionally divide into early, middle, and late dialogues. This chronology is based largely on assumptions about Plato's intentions in writing his dialogues. It is not an assumption of the translation that the ordinary English meaning of 'love of wisdom,' 'wisdom,' 'soul', and 'virtue' are an exact match for Greek words they translate. In many of these dialogues, the character Socrates engages in conversations about various matters. The dialogues in which he has these conversations (especially the Apology and other dialogues from the traditionally early period of Plato's dialogues) are the primary evidence for what Socrates thought. What Plato has the character Socrates say is the basis for defeasible inferences to what the historical Socrates thought. In working backwards in this way, it is necessary to keep in mind that (on the assessment model) the dialogues are not first and foremost imitations of historical conversations, despite the fact that many of the characters have the names of historical figures. What, then, is Plato trying to accomplish in using Socrates as a character in his dialogues? The dialogues suggest Plato thought Socrates glimpsed something important about the human condition, something he did not completely articulate and may have only partially understood. Plato tries to understand Socrates and show that he was onto something important. 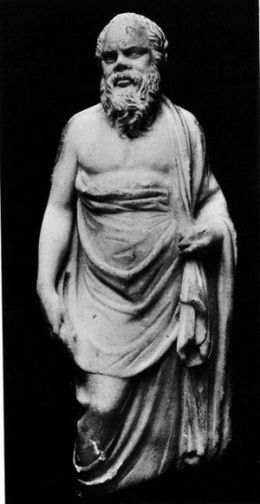 Socrates claimed supreme importance for a practice he called φιλοσοφία. This Greek noun transliterates into English as philosophia and translates as the "love of wisdom." "While I have breath I shall never give up the love of wisdom (φιλοσοφία) or stop exhorting you, charging any of you I happen to meet in my accustomed manner: 'You are the best of men, being an Athenian, citizen of a city honored for wisdom and power beyond all others. Are you not ashamed to care for money, and reputation, and public honor, while having no thought or concern for wisdom and truth and the best state of your soul (φρονήσεως δὲ καὶ ἀληθείας καὶ τῆς ψυχῆς ὅπως ὡς βελτίστη ἔσται)?' If some one of you disputes this, and says he does care, I shall not immediately dismiss him and go away but shall question, examine, test him, and if he does not seem to me to possess virtue (ἀρετήν), and yet says he does, I shall rebuke him for counting of more importance things which by comparison are worthless" (Apology 29d-30a). In his devotion to the love of wisdom, Socrates neglected many of the affairs that normally figure in people's lives. The character says that in his devotion he has neglected his own affairs in way that is "not like human conduct" (Apology 31b). Moreover, late in his life, in an event that made him the most famous figure in all of philosophy, he accepted a death sentence from the city of Athens rather than abandon his love of wisdom. In 399 BCE, Socrates was tried and executed. "The affidavit in the case, which is still preserved, says Favorinus [= a philosopher who flourished during the reign of the Roman emperor Hadrian (117-138 CE)], in the Metron [= the temple of Cybele at Athens, which was the depository of the state-archives], ran as follows: 'This indictment and affidavit is sworn by Meletus, the son of Meletus of Pitthos, against Socrates, the son of Sophroniscus of Alopece: Socrates is guilty of refusing to recognize the gods recognized by the state, and of introducing other new divinities. He is also guilty of corrupting the youth. The penalty demanded is death'" (Diogenes Laertius (3rd century CE), Lives of the Philosophers II.40). Plato, it seems, thought that the Athenians were wrong about Socrates. The indictment was for impiety and corrupting the youth. Plato seems to have thought neither charge was correct. The Apology is the second in a tetralogy of dialogues that purport to show important events in the life of Socrates. The Euthyphro takes place before his trial. It is followed by the Apology, which shows Socrates at his trial. The Apology is followed by the Crito, which shows Socrates in jail awaiting execution. The Crito is followed by the Phaedo, which shows Socrates on the day of his execution. Because the Euthyphro is first in this tetralogy, it is natural to take it to be a picture of the historical figure at work in the love of wisdom. Socrates, in the passage, is concerned with what in life is worth caring about. This might seem to be money, but he quickly rejects this answer. Money can be good or bad, depending on what one does with it. What one should care about more is having a certain competency in living. This competency seems to be what Socrates has in mind when he castigates the Athenians for not giving enough attention to "wisdom and truth and the best state of your soul." The competency in living is a way of controlling the self so that the choices one makes are the ones wisdom prescribes. Socrates describes this competency in terms of the "soul" (ψυχή) and "virtue" (ἀρετή) and suggests that the "love of wisdom" (φιλοσοφία) is the way to acquire it. It is an ongoing problem to supply the details missing from this picture of Socrates, but it is clear what we can expect Plato will do in his dialogues to try to solve this problem. Given that Plato wants to vindicate Socrates and thinks that the competency in living to which Socrates called attention is a form of control over the self so that one makes the right choices life, Plato will take up the following issues: what the self is, what choice is in this conception of the self, what makes a choice wise, what is it to exercise control over one's self and one's choice, and how one acquires the competency in which this control consists. He need not take up these issues in this order. He might take up some of them more than once as he tries out different solutions to the problems they raise. Further, he is likely to solve the problems in ways that may not always seem promising to us given the historical context that conditions our point of view. The search for "definitions" is the now traditional way to describe what Socrates is doing in these early dialogues, but it is important to keep in mind that Socrates is not interested in the meanings of words. He is asking about matters related to "wisdom and truth and the best state of [the] soul." In the early dialogues, Plato shows Socrates and his interlocutors engaged in asking and answering certain questions in what has come to be known as the "search for definitions." Euthyphro and his father farmed land in an Athenian settlement on the island of Naxos in the South Aegean (Euthyphro 4c). As part of its empire, Athens alloted confiscated land to colonies of its citizens it planted in the territories of its allies in the Delian League. This is typical. The dialogues in which Socrates searches for a definition end in "perplexity" (ἀπορία). The noun ἦθος (ēthos) means "custom" or "manner." ἠθικός (ēthikos) is the corresponding adjective. Cicero (106-43 BCE) says that "Socrates ... was the first to call philosophy (philosophiam) down from the heavens and set her in the cities of men and bring her also into their homes and compel her to ask questions about life and morality (moribus) and things good and bad..." (Tusculan Disputations V.4.10). "Socrates was the first person who summoned philosophy away from mysteries veiled in concealment by nature herself, upon which all philosophers before him had been engaged, and led it to the subject of ordinary life, in order to investigate the virtues and vices, and good and evil generally, and to realize that heavenly matters are either remote from our knowledge or else, however fully known, have nothing to do with the good life" (Academica I.4.15). Someone with the competency in how to live is not easily confused, but Euthyphro contradicts himself repeatedly in his conversation with Socrates. Socrates asks questions. Euthyphro gives answers. Socrates asks more questions. Euthyphro gives more answers. Socrates asks whether this last answer contradicts a previous answer. Euthyphro admits the point, withdraws the answer, and tries again. Socrates ask more questions, and the dialogue ends in perplexity. Euthyphro appears not to have knowledge about ethical matters, at least not about piety, but the assumption in the dialogue seems to be that such knowledge is possible. It is natural, then, to wonder what one would have to do show to Socrates that one had this knowledge. This makes Socrates part of the enlightenment tradition that showed itself in the Presocratic Period. Ordinarily competence in living would be understood as a matter of long, and often hard experience, in the sorts of situations human beings typically encounter as they live out their lives. ⊕ Only the old, not the young, are traditionally thought to have wisdom. The young learn from the old and take on the ways of the traditional forms of behavior that have been passed down from previous generations. Socrates challenges this traditional way of thinking about wisdom in terms of experience and thus challenges the traditional education. Socrates, however, as Plato portrays him, champions "reason" over "experience." The dramatic date of the Laches is between 424 and 418 BCE, when Athens was engaged in the Peloponnesian War (431-404 BCE) . Laches mentions the battle of Delium (Laches 181a), in which the Athenians were severely defeated by the Boeotians (who were allied with Sparta) in 424 BCE. (Socrates was at Delium and earlier at the battle of Potidaea (Symposium 219e, 221a). Nicias negotiated a treaty in 421 BCE that held for about a year and a half. In 418 BCE, the Athenians and Spartans again faced each other at the battle Mantinea. Laches was killed there in the Athenian defeat. Aristides was an Athenian general remembered for his role in the Persian Wars (499-449 BCE), in which the Greeks were ultimately victorious. Herodotus (5th century BCE) says that he was the "best and most honorable man in Athens" (Histories VII.79). Thucydides was an Athenian general who represented the conservative and aristocratic Athens against Pericles. Thucydides was the loser in this political confrontation and was expelled from the city for ten years. Aristophanes mentions Thucydides as someone famously defeated in oratory (Acharnians 703, Wasps 947). Socrates raises the question of the proper education for the young is in the Apology. "I happened to meet a man who has spent more on sophists (σοφισταῖς) than all the rest, Callias, the son of Hipponicus. So I asked him—for he has two sons—if your sons were colts or calves, we should be able to hire an overseer who would make them good in the virtue proper to them (τὴν προσήκουσαν ἀρετήν), and he would be a horse-trainer or a husbandman. But since they are human beings, whom have you in mind to get as overseer? Who has knowledge (ἐπιστήμων) of that kind of virtue, that of a man and a citizen (ἀνθρωπίνης τε καὶ πολιτικῆς)? I assume you have looked into the matter, Callias, as you have two sons. Is there anyone or not" (Apology 20a-b)? Callias was one of the richest men in Athens. His family leased slaves to the state for use in mining silver at Laurium (on the shores of the Agean Sea in southeastern Greece, about forty miles from Athens). This silver built the fleet that allowed the Athenians to win the second Persian War. They are ashamed that they have not done as well in life as their famous fathers, Aristides and Thucydides. So they seek advice about the proper education for their sons, as they want their sons to have better lives. This is a natural desire for parents to have for their children, but Lysimachus and Melesias are troubled because they do not know how to proceed. They turn to Socrates for guidance, and he questions the Athenian generals Laches and Nicias about what should be done. Socrates remarks to Laches that Lysimachus and Melesias "are inviting us to a consultation as to the way in which virtue (ἀρετὴ) may be joined to their sons' souls, and so make them better." In the ensuing investigation of the virtue the children need to live good lives, Socrates does not investigate what this virtue is directly. Instead, he focuses the conversation on what courage is, the traditional virtue that the generals Laches and Nicias should understand. "And you know, Laches, at this moment our two friends are inviting us to a consultation as to the way in which virtue (ἀρετὴ) may be joined to their sons' souls, and so make them better? Then our first requisite is to know what virtue is? For surely, if we had no idea at all what virtue actually is, we could not possibly consult with anyone as to how he might best acquire it? I certainly think not, Socrates. Then we say, Laches, that we know what it is. And of that which we know, I presume, we can also say what it is. Let us not, therefore, my good friend, inquire forthwith about the whole of virtue, since that may well be too much for us; but let us first see if we are sufficiently provided with knowledge about some part of it. In all likelihood this will make our inquiry easier. Yes, let us do as you propose, Socrates. Then which of the parts of virtue shall we choose? Clearly, I think, that which the art of fighting in armor is supposed to promote; and that, of course, is generally supposed to be courage, is it not? Yes, it generally is, to be sure. Then let our first endeavor be to say what courage (ἀνδρεία) is. After that we can proceed to inquire in what way our young men may obtain it, in so far as it is to be obtained by means of pursuits and studies. Come, try and tell me, as I suggest, what is courage" (Laches 190b-e). Socrates seems to assume that virtue in the soul is somehow a matter of having courage and other traditional virtues. What he thinks, it seems, is that a human being who is courageous and has the other traditional virtues is someone who has the competency involved in living. The connection between the traditional virtues and the virtue in the soul stands in need of explanation. ⊕ Plato provides an explanation in the Phaedo and Republic. The competency in living is what competency involved in living what is traditionally called "the good life," and it is not obvious without further argument that doing what courage and the other traditional virtues demand is the same as living in such a way that one is living this life. Plato was convinced that Socrates had seen something fundamentally important about how to live. This is why he writes about Socrates. He wants to understand and articulate the view Socrates outlined but did not make clear. We have seen some of the steps in this project, but the project itself continues throughout a large part of Plato's philosophical life. This project drives him in the early dialogues and culminates initially years later in his middle dialogues in the Phaedo and the Republic, two dialogues traditionally thought to be among Plato's greatest dialogues. In this way, Socrates stands near the beginning of what has become a long and influential philosophical tradition. Plato and most of the ancient philosophers who follow after him (Aristotle, the Stoics, and the Academics) all in their own ways try to understand Socrates. ἀπορέω, aporeō, verb, "to be at a loss, be in doubt, be puzzled,"
ἀπορητικός, aporētikos, adjective, "capable of inducing doubt, puzzlement,"
⊕ Plato's early dialogues in which Socrates searches for a definition are said to be "aporetic." They end in ἀπορία. The Pyrrhonians, later, connect ἀπορία with ἀταραξία (ataraxia, noun, "lack of disturbance, calmness"). ἀπορία, aporia, noun, "lack of passage,"
ἄπορος, aporos, adjective, "having no way in, out, or through,"
εὐθύφρων, euthyphrōn, adjective, "right-minded" (from εὐθῠ́ς ("straight, direct") +‎ φρων ("mind")). ⊕ "... it relates to character, called in Greek ἦθος, while we usually term that part of philosophy ‘the study of character,’ but the suitable course is to add to the Latin language by giving this subject the name of 'moral science (moralem)'" (Cicero, On fate I.1). "I may observe that the term 'moral' is commonly used as synonymous with 'ethical' (moralis being the Latin translation of ἠθικός), and I shall so use it in the following pages" (Henry Sidwick, Outlines of the History of Ethics for English Readers, 5th edition. (Macmillan and Company, 1902), 11). ἠθικός, ēthikos, adjective, "ethical,"
φιλοσοφία, philosophia, noun, "love of wisdom,"
φιλόσοφος, philosophos, adjective, "lover of wisdom,"
moralis, adjective, "of or belonging to manners", (from mos, noun, "manner, custom, way," mores, plural of mos, "customs, manners, morals," first used by Cicero to translate ἠθικός).